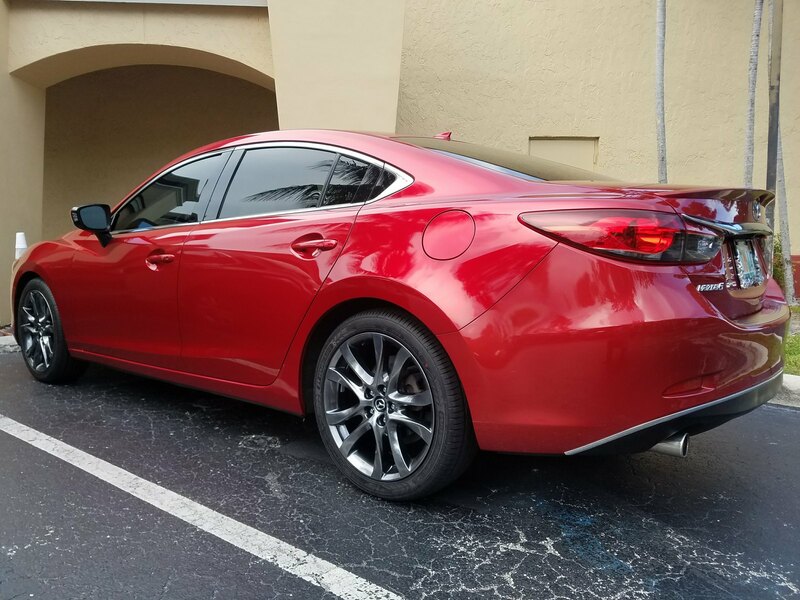 I read well over a year ago about how some GT owners with the dark wheels had paint flaking off them and Mazda warrantied them. I bought my 2016 GT on Aug 3, 2015. My wheels did not show this problem until just a week ago. (garage kept 33,600 mile car) I went to my local dealer and showed him the one wheel that was showing flaking in about 4 locations. He was well aware of the problem. I thought my other 3 wheels were fine but he found some really minor spots on them and said that is the start of the problem. Within 2 days he had an answer back from Mazda and they are replacing all 4 wheels even though I'm right at 3 months out of warranty time wise but under mileage wise. So, I'm a happy customer and my dealer has always treated me very well and kudos to Mazda for taking care of the issue. New wheels get installed Wednesday this week. I'd buy a new Maazda6 wagon tomorrow if they brought that model into the USA and I'd buy it from my local dealer. Good to hear that Mazda took care of you! Yes. GT dark silver wheels. Got the wheels installed today. I'm very pleased. Mine were replaced under warranty. New ones last very well so far. Is your local dealer J. Finger? He retired and sold the dealership to Bradshaw. The Mazda dealerships in Easley and Anderson are no more so Bradshaw Mazda now has a lock on Mazda sales in the Greenville SC area. Vic Bailey Mazda is in Spartanburg and then you have to go up to Asheville, NC. OK. I have those on my GT. I don't have a lot of miles on it yet, and so far the wheels look fine. Winter is almost here and I just took them off this week and stored them for the winter. I installed snows that are mounted on 17" rims. Quite a different ride BTW, but that's another subject. Hopefully if my 19's don't see crappy weather, then they'll be OK.
My 2016 model was built in the summer of 2015. 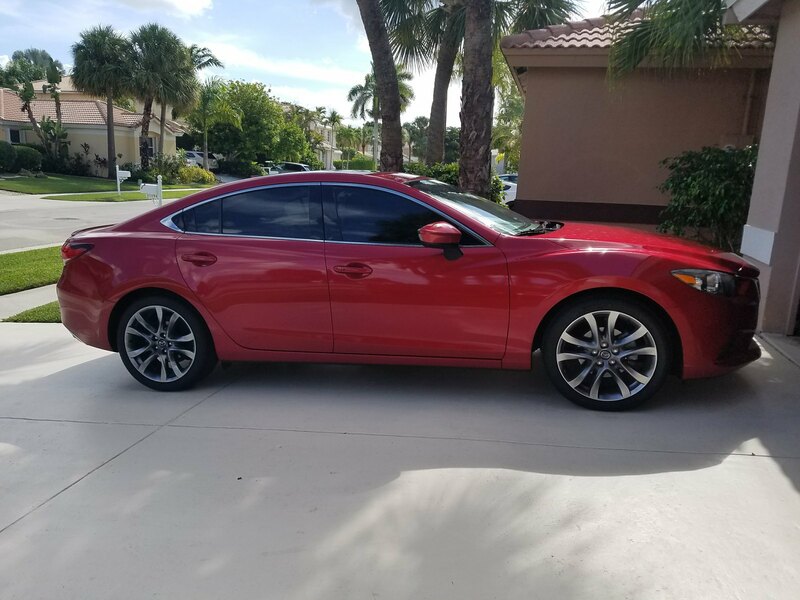 I'm not sure what model years were effected and when Mazda resolved the issue but there has been several people that got their wheels replaced. No telling how many people just ignored the issue on their car. I would certainly hope Mazda resolved the issue by 2017. I know they are still there but last time I drive by there the front row of cars were all used cars and what new Mazdas they did have were behind those and some signage was no longer up. I asked Bradshaw and they told me they let the Mazda franchise end (maybe not true)????? Let's hope you are right on the 2017's. When I bought my car last year, I brought this subject up with my sales rep, and he was up front about the problem. He knew Mazda had an issue with the rims and didn't try to dodge the subject. Of course he assured me that if there was a problem down the line, that Mazda would take care of it. I know he's supposed to say that, so we'll see what, if anything, happens. When we bought my wife's car the GT wheels were chipping. They gave us rental so they could fix the rims. It came out great back then. A few weeks ago she hit a curb and now the clear is flaking on the rim. I met Lerxst and Dirk!! Does anybody happen to have pics of what the flaking looks like? I just got my 2016 6 with the same rims, 3 out of the 4 are in excellent shape. But #4 has one area where both clearcoat and paint have come off. Not curb rash type damage, I'm hoping if anyone can show a sample of a warrantied wheel I'll have a better chance of making a claim. 2016 6GT Tech Black on White Leather. Dark silver GT wheels paint match??? GT wheel paint flaking off? Dark Silver wheel touch up paint? Paint on hood bubbling and flaking! ?